What If The Whole World Went Trick Or Treating? We figured everyone is still buzzing from their Halloween shenanigans. Either from all of the candy you ate… or that awesome costume party you attended (or both if you’re like us), so we wanted to put together a little something to keep the Halloween spirit alive for just a little while longer. #1 Excitedly planning what to be for halloween. #2 Fantasizing about all of the candy that would soon be filling our bellies! Now that we’re a little older we still find ourselves creatively planning what costumes to wear on All Hallows Eve, but the candy fantasy has transformed into curiosity. Curious about what you might ask? If Trick or Treating were a world wide tradition, what would be the most popular candies passed out around the world? In the pursuit of higher knowledge, we took to Google to find out the answer to this question to appease all of our curious minds! Also, We just want to say before we begin that our mouths were watering the entire time we put this together… Now, we are off to the store to get ourselves some Kit Kats. Enjoy! No they are not the same as the tangy chalky candies we know and love here in the States. These smarties are more like M & M’s, but much larger and with a thick and crunchy outer layer. Just looking at these brings back memories of separating all of the colored M & M’s into neat piles to be eaten in the precise order of blue, green, brown, red, yellow, and lastly orange. Growing up in Mexico, these were one of Alli’s favorite candies. She still manages to find them from time to time here in the States and always savors her childhood memories as she licks away at this tangy treat. Sort of like a push up pop, you squeeze the plastic container and savor the refreshing tamarind-flavored gel inside. The gel squirts out in tiny spaghetti-like-strings that make up the hair of the cute little character that is Pelon Pelo Rico. In Japan, this chocolate and biscuit combo is quite popular in candy form. We are most familiar with the Pocky craze, but these chocolate hamburgers seem way more fun for Trick or Treating purposes. Not surprisingly, the biscuit in this candy is the hamburger bun. The cheese is made from white chocolate while the burger patty itself is pure milk chocolate. Now, this is one that most Americans are probably familiar with. Saft Goldbären translates to “juicy golden bears” and we can definitely attest to how good these juicy bears are. We’ve always found normal gummy bears to be bland, but these golden bears are packed full of juicy goodness! They claim to be made with 25% real fruit juice which begs the question as to what the other 75% is actually made of… but they sure do taste good! No mystery here, these pineapple lumps are just that: lumps of pineapple coated in milk chocolate. We asked a Kiwi (person from New Zealand) friend of ours about them and he told us they are the best candy in the world (but he also says that about most things from New Zealand 😂). Having never tried them before we decided to order up a bag on Amazon to decide for ourselves. A delicious chocolate wafer filled with refreshing mint flavored toffee from South Africa. If it’s anything like a Peppermint Patty, then we’re in! We’re definitely a fan of anything with mint in it, particularly with the changing seasons ahead and the cold weather! What better to share a steaming cup of tea or coffee with? That’s A (Candy) Wrap(per)! 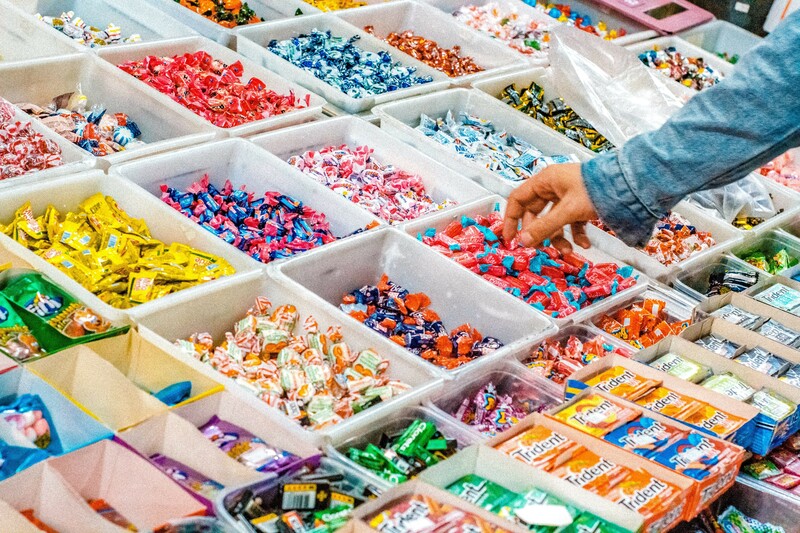 We could keep on exploring the best candies in the world all day, but we’d hate to make your tummies rumble, so you’ll just have to check out more for yourself.